Pope Francis asked that Mary intercede on behalf of those imprisoned during his January 16, 2018, visit to the Female Central Penitentiary of Santiago. The visit is part of his January 15-22, apostolic journey to Chile and Peru. The Holy Father also recalled the words of Jesus in the Gospel of John, the story of the woman caught in adultery: “Let him who is without sin among you be the first to throw a stone.” And he talked of the three things that greeted him on his arrival at the facility: mother, children, flowers. 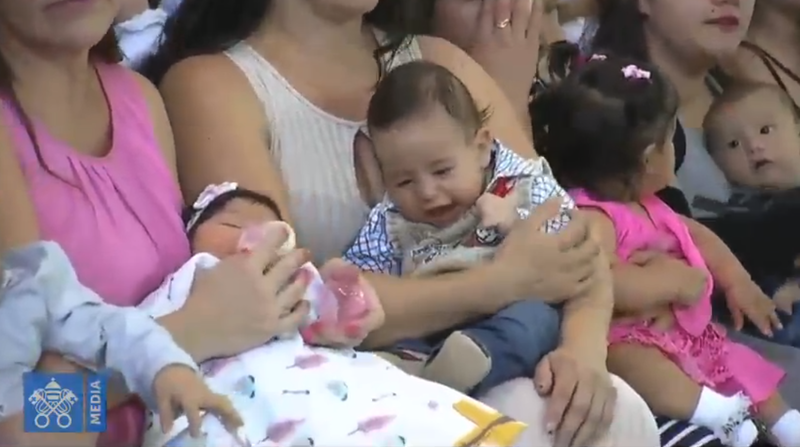 “Many of you are mothers and you know what it means to bring a new life into the world,” the Pope said. He went on to proclaim that motherhood is a gift and can never be a problem. And he asked the residents to care for the future, not only for themselves but for their children. “Children are our strength, our future, our incentive,” Francis told the women. “They are a living reminder that life has to be lived for the future, not remain in the past.” He encouraged the prisoners to look to the future when they will return to live in society. Thank you for giving me this opportunity to visit you. For me, it is important to share this time with you and draw closer to our many brothers and sisters presently deprived of their freedom. Thank you, Sister Nelly, for your kind words and especially for testifying that life always triumphs over death. Thank you, Janeth, for coming forward and sharing your hurt with all of us, and for your courageous request for forgiveness. How much we all have to learn from your act of courage and humility! I quote your words: “We ask forgiveness from all those whom we have harmed by our misdeeds”. I thank you for reminding us that without this attitude we lose our humanity. We forget that we did wrong and that every day is an invitation to start over. Mother. Many of you are mothers and you know what it means to bring a new life into the world. You were able to “take upon yourself” a new life and bring it to birth. Motherhood is not, and never will be a problem. It is a gift and one of the most wonderful gifts you can ever have. Today you face a very real challenge: you also have to care for that life. You are asked to care for the future. To make it grow and to help it to develop. Not just for yourselves, but for your children and for society as a whole. As women, you have an incredible ability to adapt to new circumstances and move forward. Today I appeal to that ability to bring forth the future that is alive in each one of you. That ability enables you to resist everything that might rob you of your identity and end up by killing your hope. to the day when you will return to life in society. For this reason, I applaud and encourage every effort to spread and support projects like Espacio Mandela and the Fundación Mujer levántate. We all know that, sadly, a jail sentence is very often simply a punishment, offering no opportunities for personal growth. This is not good. On the contrary, those initiatives that offer job training and help to rebuild relationships are signs of hope for the future. Let us help them to grow. Public order must not be reduced to stronger security measures but should be concerned primarily with preventive measures, such as work, education, and greater community involvement. Lastly, flowers. I believe that life itself “flowers” and shows us all its beauty when we work together, hand in hand, to make things better, to open up new possibilities. With this in mind, I greet all the pastoral workers, volunteers and professional personnel, especially the police officers and their families. I pray for you. Your work is sensitive and complex, and so I ask the authorities to try to provide you too with the conditions needed to carry out your work with dignity. A dignity that engenders dignity. Mary is our Mother and we are her children, you are her daughters. We ask her to intercede for you, for each of your children and your dear ones. May she cover you with her mantle. And I ask you, please, not to forget to pray for me.